Overview: With the addition of Intelli-Note, GoldVisionPro moves beyond Enterprise Content/Document Management into overall staff productivity. While Intelli-Note is a useful tool for existing GoldVisionPro processing, it also provides a UNIVERSAL WORKSPACE for users working in GoldMine, or any other application. As with other customizable features of GoldVisionPro such as Intelli-Entry+, Intelli-Processing, Intelli-Search and Intelli-Tracking Workflows, the power of Intelli-Note is that it provides a highly customizable and flexible environment, adaptable across a broad variety of business uses. The Intelli-Note window provides three independent workspaces, which can be expanded and contracted to fit the user’s preferences/needs. Users compose their message/note in these areas, adding hot-key [or mouse-click] insertable information from a wide variety of sources as needed, and then drag or one-click-copy all or part of the text to another location. Two of the areas also can be set to display information from the currently active Contact in GoldMine, which automatically updates whenever the Contact changes. 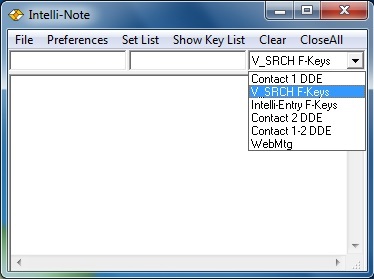 Key Assignment Lists define what happens when a user presses any configured Special keys or combinations. [e.g., F5, or Alt+n, or Ctrl+Shift+2, etc. ], or mouse-clicks the item in the Key Assignments window. Multiple lists can be created as needed, and users can switch between one active list and another by simply selecting from the Intelli-Note drop-down list. Each list can have a completely different set of actions. 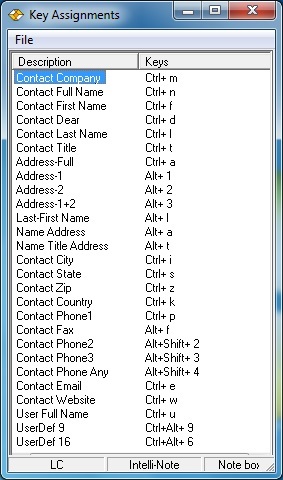 This allows the user to insert a wide variety of information in the workspace along with user-typed text. Each of the three workspaces can have a different active list, for quick access to multiple data sources. The Key Assignments window displays the active key assignments for quick reference, automatically updating for the active list selected. Coupled with the addition of V_SRCH to GoldVisionPro's many custom capabilities, Administrators can now provide users with instant one-key/one-click access to any information from GoldMine. This powerful feature enables retrieving and inserting the results of any custom SQL Queries by simply assigning each of the Query names to various Special keys or combinations in a Key Assignment List. Any Text File for standardized paragraphs, legal statements, user contact-info block, disclaimers, warranties, etc. Any Text Entry for a wide variety of commonly-used words, phrases, etc.